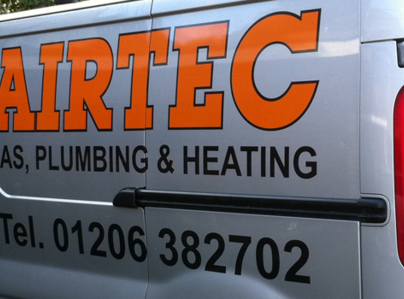 Airtec is an established business in and around the Colchester area. Specialising in boiler repair and replacement, we offer a fast response service. Airtec was first established in the year 2000 working in the surrounding areas of Essex. We are a privately owned professional company with a friendly dedicated team able to provide you with solutions to your heating and plumbing requirements. Our aim is to provide our customers with a professional service and ensuring safety with our engineers who are GAS SAFE and OFTEC registered to maintain at a high quality. Let our friendly, dedicated, GAS SAFE and OFTEC registered team assist you, with a professional service and high quality workmanship. New boiler installation. Quick response from initial enquiry, competitive detailed written quotation received in a couple of days and installation date arranged within a week. Work carried out by friendly, polite, tidy, employees to a high standard right down to clean up at end of job. A truly professional service from start to finish and would have no hesitation in recommending this Company. Our old floorstanding boiler started leaking last week and after initial investigation it was clear that it was irreparable. We contacted three firms, one through our usual maintenance person and two via the Worcester website. Airtec got back to us within hours of the online request going in and Steve came out that afternoon to provide a quote. It was a fair quote, more or less right on what I expected to pay, and best of all he was able to book us in for the following Tuesday. The team that fitted the boiler did an excellent job - no mess, no fuss, everything explained and checked with us. Steve was around regularly to check that everything was going well and by 3.00 that afternoon we had heat. By 11.00 the following morning they had been back to flush and commission the system. Replacing your boiler is a potentially fraught experience. Until they have been and done the work you don't know if it is going to be done well or not. This was a completely positive experience. Fair price, excellent service and a lovely job. Nice one Steve! Airtec installed a new combi boiler for me today & I must say how impressed I am with the efficient service I received, they were very friendly and took the time to explain everything to me, they also left my house spotless! Airtec have just finished installing a new central heating system and sorting out the plumbing for me. We were impressed at every stage of the process from the initial consultation and quotation through to the finished work. We wanted to deal with a smaller local company rather than a big national concern. It is fair to say we paid a bit more, but were very pleased that we did. The engineers were at all times professional and left the house clean and tidy at the end of each working day. Most importantly, the system was delivered as promised without any nasty surprises by way of "extras". Thank you Airtec. Prompt friendly response. Quick quotes. Excellent value for money. Friendly knowledgeable workmen. Always happy to complete snagging. Reliable turning up and getting the job done. Would definitely recommend. Could possibly improve further by cleaning up a bit more after themselves but very minor point.